Enterprise Resource Planning (ERP) and Customer Relationship Management (CRM) are two vital components for any business organization for their successful run. Due to numerous reasons like the commonality of their features, they are often misunderstood in the same application. Both ERP and CRM are used by the business organizations to improve and increase their profitability. CRM and ERP are two different set of application with similar features, at times completely integrating with each other. What makes ERP different from CRM is their core functionalities. Both ERP and CRM have their own set of characteristics and features exclusively working for the betterment of what they are designed for. CRM as the name it manages the business communications and interaction with their potential clients/ customers. They take care of the overall interactions happening between the business and their clients by organizing the communication, automating and thereby synchronizing their sales, marketing division and thereby improving the customer service. CRM acts as a complete software application taking care of customer relations, their experiences, keeping them happy and thereby turning them into loyal customers of the respective business. The prime focus of any CRM revolves in and around the business clients via identifying all potential leads, secondly nurturing them to prospective sales processes. While CRM takes care of the complete aspects pertaining to customers, an ERP takes care of the complete management of a business. ERP works for the overall profitability and efficient management of the business processes. Like CRM provides the information pertaining to customers, an ERP enables with processing and sharing of real-time information among several departments. An ERP enables the employees to enter the valid information to the application system, creating a real-time access platform. An ERP streamlines every business processes enabling effective planning in advance. 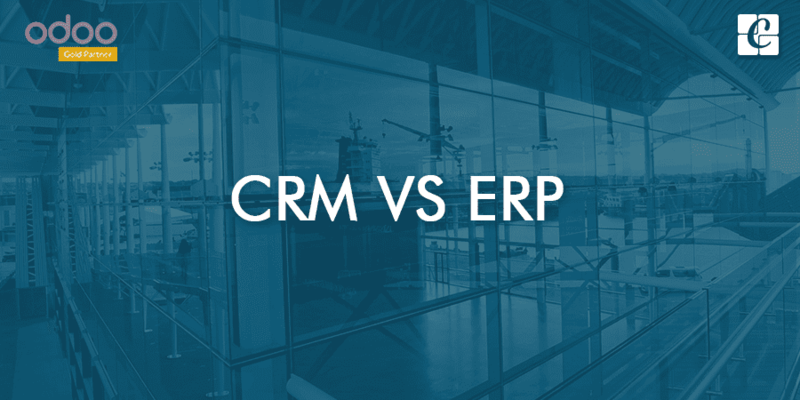 If we see CRM vs ERP, from end users point of view, both are quite different. The major user percentage of CRM systems are of the sales and support organizations who are revolving in and around the customers. Their ultimate functionality is customer facing activities which do not involve working behind the production and fulfillment of orders. Whereas, the ERP users are among the factory management team, production schedulers, buyers, supply chain, and finance related authorities. ERP users are mainly involved with the internal and supplier-facing activities, rarely involved in the tasks like calling the prospective/ current customer except replying to any kinds of complaints. CRM vs ERP with respect to functionality, CRM software application focusses on the fulfillment of the customer-side activities. CRM manages every customer information relevant to the company. This information is later used by all business departments from sales to managers, later by accounting personnel. On the other hand, an ERP software turns the business processes into more effective and efficient format. An ERP encompasses all the key functionalities of the business like their accounting, warehouse, inventory, supply chain, human resource etc. With an integrated ERP software, a business can be made to run successful and efficient. As every information is streamlined here under ERP, it gives a warning/alerts to the companies whenever a problem arises. For example: If there is a problem in the supply chain, an ERP software within short time captures the issue and timely respond via making the information available and accessible to all related areas, such as the warehouse. ERP not only provides the departments with updated and pertinent information but also provide companies with a clear and precise picture of their standings. Is CRM a part of ERP? An ERP works for the overall welfare and effective management of a business. Customer satisfaction is the underlining factor or key supplement for any business growth and expansion. In that case, CRM plays a crucial role in ERP. It acts as an integral component of ERP managing the business communication effectively and efficiently with their current and prospective clients. With CRM integrated into an ERP, a business can efficiently manage the leads, tracking both pre-sales and post-sales activities. The Customer Relation Management helps in generating the revenues for business by converting every possibility of business opportunities to sales leads. An ERP turns comprehensive and effective when it encompasses all the following modules like CRM, Human Relations, Accounting, Warehouse, Point of Sale, Inventory Management, Manufacturing, Sales, Purchase, and E-commerce etc. In nutshell, both ERP software and CRM software plays a pivotal role in the business success and their overall profitability. CRM manages the integral communications of the businesses with their clients whereas ERP manages the communication within the in-house departments of the business organization. The benefits of integrating CRM software with ERP software can ensure optimal investment returns and initiate the employees to make better decisions in their work. Ultimately, CRM within ERP software ensures that the expectations of the customers and finally the business goals are met on time. The integration guarantees that all internal departments under the organization are working together in sync.